300 professionals from 30 countries attended the 13th summit. This year's installment of Europe's best information architecture gathering was my second visit. I was happy to have a similar takeaway: [EuroIA](http://euroia.org/) has been a great way to check my perspectives, infuse them with the views of others and step back, dwell on the point of all this. 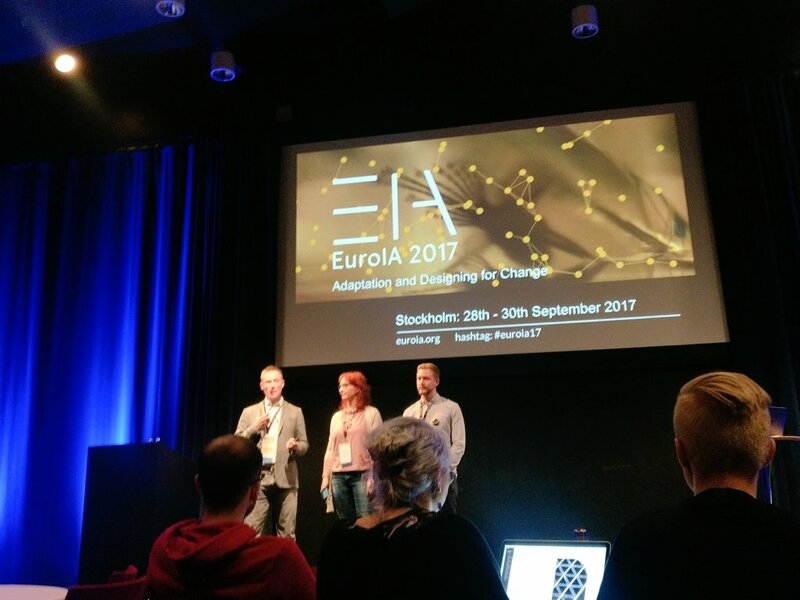 I was fortunate enough to be one of three staffers from EMBL-EBI — and one of two with the Web Development team — to attend this year's Euro IA conference in Stockholm, and aside from the general fantastic food, views and culture of Sweden and Stockholm, here's a sprinkling of personal highlights from EuroIA. This feeling was most evident in ​Stephanie Akkaoui-Hughes' Thursday keynote that focused on "Architecting Interactions". Don't design an interaction, design context for an interaction. That is, don't force a user to push the button to open doors, create an environment where pushing a button seems how you should open a door. Stay organic, flexible and holistic: "Incomplete, impermanent, imperfect"
Her slides don't appear to be online, but you can see a video from a similar earlier presentation here. Reviewing work to rein in some 50 different domains, Anya Somerville, Silver Oliver and Michael Smethurst presented on Domain Driven Design at UK Parliament. To discover what is closest to the truth, they noted the importance of talk therapy to get stakeholders relaxed and open. Often this revealed the important things which no one had previously thought to mention. Also of importance was to keep the rather complex concept domain driven design as an inclusive and facilitating process — avoiding past incidents where those who could not master IA-speak were simply forced out. Observation: To vertically integrate or be web-wide? A point of interest when contrasting with work to unite EMBL's IA, where Parliament has been able to pursue a unifying IA, it also sees an opportunity to unite its implementation stack. This is in contrast to our work at EMBL, while we are also working to formulate a global IA we are unable (for better or worse) to recommend a single technical stack. This complicates things, but provides interest in that our IA should — in theory — be largely technology agnostic. Reminding me I should take an extra five minutes in preparing everything I do, Alisan Atvur presented on "Why Insights Die" and I see a key fulcrum: convert research into action by placing evidence on a logical path to conclusion. Maybe ears aren't deaf, maybe you're just haven't localised your dialect. 4. Where is this all headed? Sandwiching in the conference, IA celeb Lou Rosenfeld presented on "Beyond User Research". One can't say if it was fully the intent of Rosenfeld, but the message I heard tied in well to the theme of many talks: what we do doesn't matter if nothing changes. There's plenty more to be and said said for EuroIA 2017, but I'll draw a focus: IA and UX have achieved a great success in getting institutional attention. The metaphorical metal is hot. The time is now and we should translate our methodologies into operations to enact change. Abstract concepts and data are the heat for our metal, our solutions are the forging, but we must not forget to help our colleagues temper these notions into working methods. Thereby we best resist entropy. We always aim to better the path to organisational and user success, to get there we work with and within our organisations to build reusable tooling and methods. We help discover the best series of actions, then we aim to make the best the default. Once you've done that, loop back and see what is now the best series of actions. It really all does come back to organisational change, and we can best achieve that by improving the organisation's tools. If you're itching for more, you can get many of the slide decks from EuroIA 2017 here, or get the highlights on Twitter and don't forget the 2018 edition is coming in September to Dublin. Go on, read a bit more. Those links are just a wafer thin mint. I do web architecture, holistic design, and a bit of UX and development. What you're seeing was made with a combination 1 2 of the Foundation Framework, CSS/Sass, responsive design, Gulp, Panini static site generator, Markdown and some other stuff and then hosted through Travis CI and Github pages3. In years past I would have likely made this site with Drupal, but for smaller sites with savvy editors I've been using static site combinations to simplify maintenance.